Bookride: In His Own Write. John Lennon, 1964. "Puffing and globbering they drugged theyselves rampling or dancing with wild abdomen, stubbing in wild postumes amongst themselves . . ."
John Lennon. IN HIS OWN WRITE. Jonathan Cape, London 1964. Once in a long far awow, in the Germanic land, there was a great city with Grubbelsberg or something like that, with an Obermeister-Bergelmasty who was in charge. Now there they had a surfeit or rat-suffery, where all they used to creep and out and gnaw sniff and gribble into the early mord (and the late evage) there, biting the bits of the table, also the tea-clothers; and when people were asleep in their beds, so these rats would gnaw into the sheebs and also the whiskers of those who was dangly hoaver. VALUE? Just sold a bright, clean first UK copy on ebay for $298 (that's our actual photo) which is pretty much it. We got alot of emails over the 10 days asking whether it was truly a first or a 'first edition, first impression' even though we illustrated the edition statement and insisted it was the true first. It is not ignorance but distrust - too many punters have been fooled into buying reprints that have been described as first editions either by crooks or dimwits, often both. To get anymore than £150 it has to be some sort of advance or review copy or an uncorrected proof or a signed presentation from the author. One signed twice by Lennon and also by all 3 other Fabs is on sale at £15000 and could well sell. The Spaniard in the Works from 1965 is worth about the same money if not slightly more. Meanwhile it is said that prison guards (screws) short of a few bob get John's assassin Mark Chapman to sign copies of his favourite book 'Catcher in the Rye' and put them on ebay. Quis custodiet ipsos custodes? Conspiracy theories abound including an attempted connection with Billy J Kramer and the NY block where John was shot -- Billy's group was called 'The Dakotas' (geddit?) --also Mia Farrow who was at Rishikesh with the mantra muttering moptops was in 'Rosemary's Baby' which was filmed at the Dakota building. Say no more. Rare photo of Billy J and his band and Gerry Marsden with the Fab Four beneath. 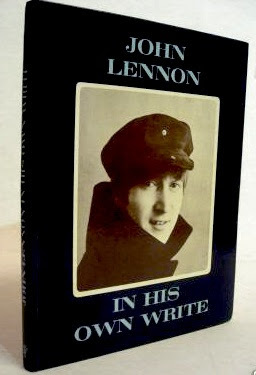 I have the same book, except inside the 1st page there is a handwritten note taking about what the book owner was doing when he heard about Lennon's murder. It's in perfect condition, a little worn on the ends of spine. Would ths be worth anything? I have a 1964 edition, first published March 1964,Reprinted April1964,Reprinted April 1964. Thus I bought in in April1964...in excellent condition..value please? I have a copy that says on the title page just, Simon & Schuster, New York, 1964"
On the page behind that all that is on that page is "c1964 by John Lennon, Cover Photograph by Robert Freeman, Printed in Great Britain." I managed to pick up In his own Write, September 1964 print in excellent condition. I'm just wondering on current values. any idea would be great. Thanks.